AN AMERICAN from the state of Massachusetts has revealed herself as the winner of a $US758.7 million ($960 million) Powerball jackpot - and says the first thing she did was call her employer. "I have called them and told them I will not be coming back," Mavis Wanczyk, 53, who has worked in patient care at Mercy Medical Centre in Springfield, Massachusetts for the past 32 years, said at a press conference. 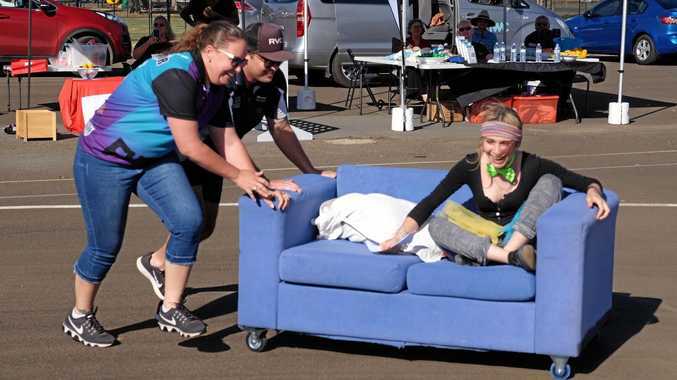 Ms Wanczyk, a mother of two children, a 31-year-old daughter and a 26-year-old son, said "the first thing I want to do is sit back and relax." "I just want to be me. Be alone and figure out what I want to do," Ms Wanczyk told reporters. 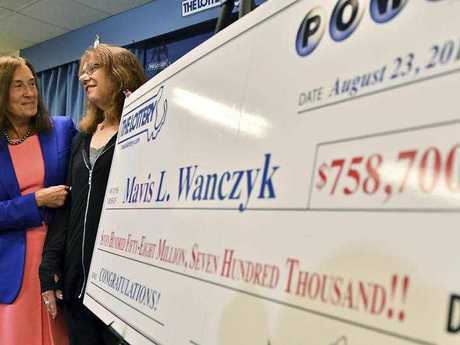 Ms Wanczyk called winning the lottery "a pipe dream" she's always had and was stunned when she found out on Wednesday night that her ticket won. She found out while she was leaving work on Wednesday night with a colleague named Rob who read off the winning numbers. "I said I have that, I have that," she said. "He goes, 'let me see that ticket and he goes, 'you just won!'" "I said, 'you're joking, come on, please,' and he said, 'sign that ticket now,'" Ms Wanczyk recalled. She added: "Last night I didn't feel like I won. Today as I'm driving here I'm like, 'this can't be true. This can't be.' And now it's like 'ahhh, I'm a winner … I'm scared, but I'll be okay." Ms Wanczyk, a regular lotto player, had purchased the winning ticket on Wednesday afternoon from the Pride Station & Store in Chicopee, Massachusetts where she lives. "I just buy it because of luck. This is a chance I had to take," she said. Ms Wanczyk said she chose the numbers at random using some birthdays and "special" numbers to her. She also chose two Quick Picks. To celebrate her new-found riches, Ms Wanczyk said: "I'm going to go hide in my bed." She also plans on "paying off" the car she purchased in September. The Chicopee gas station store where Ms Wanczyk bought ticket will get $50,000 for selling the winning ticket. Bob Bolduc, 73, the owner of the chain of Pride stores, said he will be donating all of the money to charity. "We are very happy for the winner and we'll be donating the $50,000 to several local charities that we support," Mr Bolduc said. Mr Bolduc wouldn't name the charities, but said they will be "focused on local foster kids, children in need, education for kids, all local programs."